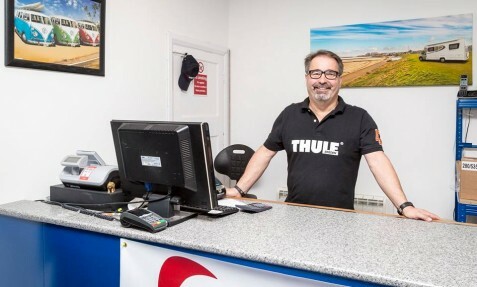 A specialist in Thule, Omnistor, Fiamma, Vango and other big name Camping, Caravan, Motorhome and Leisure equipment plus a large range of accessories. We pride ourselves on our vast experience in the industry and bringing our specialist knowledge direct to the public at competitive prices. Offering a fast, efficient service both online and at our Caravan and Motor Home CL Site in Stourmouth. Come and visit us, browse our range and experience our fast, efficient and friendly service first hand. Close to Park Holidays Birchington Vale Holiday Park, and within easy reach of many other holiday parks in the South East area of Kent. Your ideal stop if you’re on the way to France. Stop overnight in your motorhome or with your caravan, there are the sites nearby or stay and visit our beautiful coastlines. Also just perfect if you need those last minute supplies! Prior to moving into the leisure industry Leisure Plus Direct company owner Kevin Hunter was a Lloyds Insurance Broker, commuting to the City of London on a daily basis lost in the every day hum drum of the commuting drone. It was a neighbour of his who introduced Kevin to Peter Doman, the owner of a very succcesful Motorhome dealership in South East London called Bromley Motor Caravans. From an initial meeting and a friendship struck, Peter asked Kevin if he would like to come along to the then Caravan and Camping Show at London’s Earls Court. He worked and sold on the Autotrail stand and met some great characters in the motorhome industry. After attending a few of these shows Kevin permanently joined Bromley Motor Caravans in 1985 and became their Workshop/After Sales Manager. Part of his role was running the shop at base and was also tasked to run the small FIAMMA retail stand at Earls Court selling products to the general public. This was Fiamma’s, first retail stand of any form or recognition at a Caravan / Motorhome show. The stand was around 18 square metres. It was purely a desk with a storage room for Fiamma brochures! As the popularity of motorhomes grew, the name Fiamma became more recognised in the industry and more customers wanted awnings, bike racks, roof racks, ladders etc etc on their motorhomes. With Bromley Motor Caravans Kevin set up a mobile fitting service, initially attending the Motor Caravan Jamboree. It was a huge success and from this show the “Fiamma Pit Stop “ was born. So Kevin and the Fiamma Pit Stop attended many other shows around the country as well as now having a huge stand at the London Caravan and Camping show in Earls Court. Kevin’s enthusiasm was recognised by the wholesale industry and he was head hunted to join the importer of Fiamma and after 3 years became “Fiamma Manager for the UK”. This meant that he was managing the products coming in to the UK as well as organising and promoting more shows around the country the caravan and camping shows that were now being booked at the Birmingham NEC with a 80 square metre stands. Early in 2015 Kevin decided that it was time again to move away from the wholesale side of the industry. As keen as he was to stay in the industry, driving all over the country responding to customer’s needs dealing with the many issues over the phone. All of these issues were taking there toll. So, when an opportunity came along Kevin decided to move away from the wholesale side of the industry and to open his own business. So in June of 2015, Leisure Plus Direct was founded. Initially, as it all started and Kevin was looking to perhaps run an on line business with an option to attend the indoor outdoor shows. Everything seemed to fall into place and from a chance meeting a retail shop was offered to him. So if you are in the Broadstairs, Margate Ramsgate, Birchington or in the Thanet region please call in and have a look at what he carries on his shelves, he now has a couple of vans supplying to some local caravan and camping site shops. Leisure Plus Direct now has a very busy a functioning shop on EBay. There is also a page on Facebook under Leisure Plus Direct… This covers all different aspects of the company, the shop with all new products and offers plus allows customers to leave Feedback and you are always very welcome to “Like” his page..
His enthusiasm for the industry still seems to be growing be it in another sideways direction Kevin may have moved away from the wholesale side of the industry but his heart is still beating hard and fast here in a growing retail leisure side of the industry.